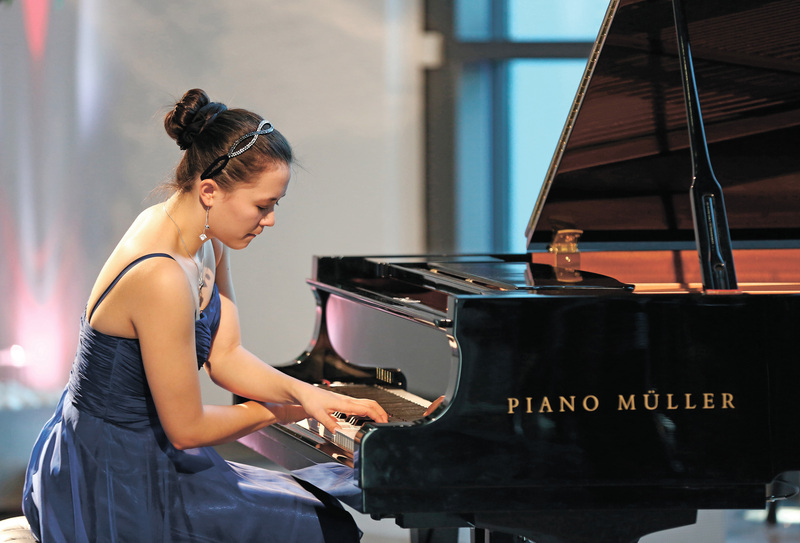 22-year-old pianist Nina Scheidmantel filled a musical evening at automotive supplier Brose with works by Edvard Grieg, Wolfgang Amadeus Mozart and Robert Schumann. More than a hundred guests enjoyed an unusual concert hosted by automotive supplier Brose in Coburg on the evening of October 6, 2014. The young pianist Nina Scheidmantel created an atmospheric musical evening with the theme “Culture meets technology – rhythms in harmony” in the foyer of one of industrial company Brose’s administrative buildings. In his short welcoming speech, Michael Daniel, Vice President Human Resources Brose Group, highlighted the link between art and technology. Rhythm and timing are as important in music as in the production of mechatronic components and electric drives. Competence, discipline and precision are essential prerequisites for success both in culture and in industrial production. These are the qualities that make Nina Scheidmantel into a pianist who has already made a name for herself beyond the immediate region. The 22-year-old from the greater Coburg area began her recital at Brose with works by Edvard Grieg and Wolfgang Amadeus Mozart. In the second half of the evening, she went on to fascinate listeners with her interpretation of the character variations from Robert Schumann’s Symphonic Etudes. Nina Scheidmantel played this entire challenging work – lasting around 40 minutes – from memory. The audience showed their appreciation of the young musician’s brilliance and her deep musical understanding with an ovation that went on for minutes. Michael Stoschek, Chairman of the Brose Group, also declared himself deeply impressed by the achievements of the young pianist. In his words of thanks, he described the musical evening as a “shining hour” in the history of the building. The piano concert at mechatronics specialist Brose had become possible through his initiative. Nina Scheidmantel began her musical career at six years of age. Four years later, she gave her début performance with a solo evening at the piano. At 15, she was already enrolled at the Würzburg University of Music as a junior student. Among other awards, the pianist has been a prize winner in the German competition for young musicians “Jugend musiziert” and has received scholarships from the Richard Wagner Scholarship Foundation and from the German Johann Strauss Society. Her musical talent has already brought the 22-year-old concert appearances in the Ukraine, Belgium and China. Nina Scheidmantel will give a chamber concert in the hilltop castle Veste Heldburg in the district of Hildburghausen in Thuringia on Sunday, October 26, 2014, at 2.30 p.m.